Mushroom day on the theme “Mushroom in vertical farming”. 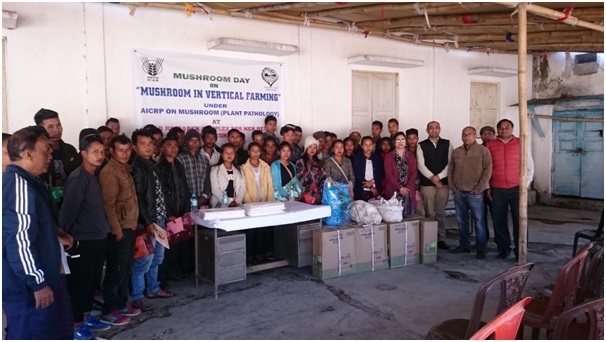 Mushroom day on the theme “Mushroom in vertical farming” was celebrated at Plant Pathology, ICAR Research Complex for NEH Region, Umiam, Meghalaya. Farmers were apprised about the concept of vertical farming and its role in increasing farmers’ income through mushroom cultivation. Farmers were also apprised about the concept of low cost mushroom house where vertical space can be utilised efficiently for round the year cultivation of mushroom. The programme was attended by around 40 farmers and scientists from out Institute. A demonstration on Oyster mushroom cultivation was also conducted followed by an interaction with farmers. Various inputs like knapsack sprayers, mushroom spawn etc. were also distributed to the beneficiaries. The programme was coordinated by Dr. Pankaj Baiswar, Dr. Tasvina R. Borah and Dr. H. Rymbai.